A suit with a comfortable cut with pockets. 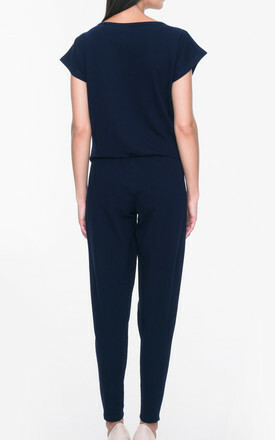 It has a loose top with a wide neckline, giving the possibility of subtle unveiling of the arms. It also has a rubber band at the waist with a decorative string that gives it a sporty character. Sewn from a nice to the touch and good quality knitwear. A tracksuit is a must-have for every woman's wardrobe. Maintenance: machinewash at 30 °C, Dry in an upright position.